The parcel of land in Jalan Bukit Bintang could fetch more than RM3,000 per sq ft, possibly a record price for a land deal in Malaysia's history. Singapore's property tycoon Kwek Leng Beng is in talks to sell a parcel of land in Jalan Bukit Bintang, Kuala Lumpur, which could possibly fetch a record price for a land deal in this country's history. It is understood that the selling price for the land, owned by Kwek's City Developments Ltd (CDL), is being negotiated for more than RM3,000 per sq ft.
To date, the most expensive land deal reported has been Sunrise Bhd's acquisition of Wisma Angkasa Raya in Jalan Ampang, Kuala Lumpur, for RM2,588 per sq ft. In May this year, FFM Bhd and Kuok Brothers Sdn Bhd sold a piece of land in Jalan Perak, Kuala Lumpur, for RM2,200 per sq ft.
CDL's land in Jalan Bukit Bintang is about 32,000 sq ft. At RM3,000 per sq ft, the deal could fetch RM96 million. The land sits between the Grand Millennium Kuala Lumpur hotel and the Pavilion Kuala Lumpur shopping centre. CDL, which is part of Singapore's Hong Leong Group, also owns the Grand Millennium hotel. Contenders for the land are believed to be the owner of Pavilion Kuala Lumpur and the YTL group, both of which have sizeable assets along Jalan Bukit Bintang. Sources told Business Times that the RM500 million Millennium Residences project originally planned for the site and launched in 2007 had been aborted and that the land was being negotiated for sale. A quick check at the site revealed that the project signage and hoarding had been removed. Some work on the 42-storey high-end condominium with an additional 15-storey crown started in 2008, but has since stalled. In late March, a spokesperson for Singapore's Hong Leong said that the Millennium Residences would be launched later this year. However, replying to a follow-up question from Business Times last week, the spokesperson said: "There are no details on the Millennium Residences available at this point." When asked if the project had been scrapped and the land was being negotiated for sale, the spokesperson said: "We have no comment at this stage." Pavilion Kuala Lumpur is wholly owned by Urusharta Cemerlang Sdn Bhd, which in turn is 51 per cent owned by Urusharta Cemerlang Development Sdn Bhd and 49 per cent by the Qatar Investment Authority (QIA). Pavilion Kuala Lumpur will be managing the new Fahrenheit 88 shopping centre, previously known as KL Plaza. It belongs to Makna Mujur Sdn Bhd, which is owned by Pavilion International Development Fund Ltd, of which the principal is the QIA. 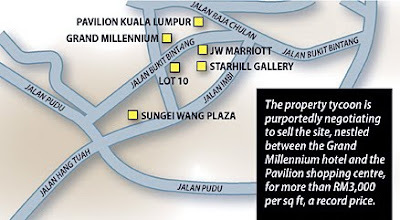 YTL owns the Starhill Gallery and Lot 10 shopping centres and the JW Marriott hotel in the vicinity. CapitaMalls Asia Ltd, the retail property unit of Southeast Asia’s biggest developer, may seek shopping-center ventures in Vietnam after expanding in markets including China and India. Singapore-based CapitaMalls may collaborate with its parent company CapitaLand Ltd to explore "interesting opportunities" in Vietnam, Chief Executive Officer Lim Beng Chee said. CapitaLand, which is building homes in the nation, said this year it expects properties in Vietnam to make up 10 per cent of its assets in three to five years from about 1.5 per cent now. “If they come across something interesting that we could look at for a shopping mall, we can tap on their expertise to go into the market,” Lim said in an interview in Singapore late yesterday. CapitaMalls is seeking retail projects in Vietnam as the economy expanded 6.4 per cent in the three months through June, compared with 5.8 per cent in the first quarter. The company also plans to invest S$800 million (US$592 million) to S$1 billion in the second half in Singapore, Malaysia and China, it said yesterday. The retail property operator will also open three more malls in China by the end of the year in addition to the four properties it recently acquired, Lim said. "There is definitely a positive outlook on retail in the region," said Ong Choon Fah, head of research at DTZ Debenham Tie Leung in Singapore, a real-estate consulting group. Lifestyle changes in the region "will support retail, but it’s very competitive. There will be some that do exceedingly well, and there will be some that fall to the wayside." CapitaMalls said yesterday its second-quarter profit fell 24 per cent to S$113.1 million as it booked a smaller gain from the increase in value of its properties. Without the one-time changes, earnings would have increased six times, it said. In Singapore, CapitaMalls plans to eventually offer its ION mall development along the Orchard Road shopping belt to CapitaMall Trust, the island state’s biggest real-estate investment trust, which it manages. The sale will only be considered when the property is "stabilized," Lim said. Sime Darby Bhd, the country's largest conglomerate, wants to double its healthcare revenue in three years, looking for land outside the Klang Valley as well as Sabah and Sarawak to build its hospital portfolio. The healthcare division currently contributes less than 5 per cent to group revenue. Last year, Sime Darby posted a net profit of RM2.3 billion on a revenue of RM31.01 billion. Sime Darby Property Bhd managing director Tunku Datuk Badlishah Tunku Annuar said the group may buy land to build its own hospitals or co-develop with others. Tunku Badlishah said it may also consider buying existing hospitals and refurbishing the properties. "It can be costly to set up a hospital. Returns on investment can take a while. The best thing is to form smart partnerships like what we did with Perdana ParkCity (Sdn Bhd)," he said. Perdana ParkCity, a unit of the timber-based Samling group, is building a RM143 million hospital on a design, build and lease concept in the Desa ParkCity township in Bukit Menjalara, Kuala Lumpur. 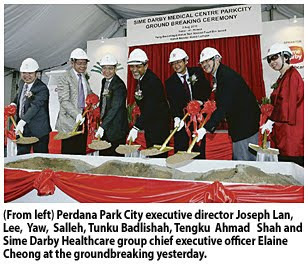 The 300-bed hospital, called Sime Darby Medical Desa Park City, will operate by first quarter of 2013. Sime Darby Healthcare has an agreement with Perdana ParkCity to lease the hospital for 15 years. "We are bullish on the hospital, which is dedicated to women and children's healthcare. It will have good catchment," he said after the ground breaking ceremony at the project site yesterday. It was officiated by City Hall director general Datuk Salleh Yusup. Also present were Sime Darby Medical Centre Subang Jaya chairman Tengku Datuk Ahmad Shah Sultan Salahuddin Abdul Aziz Shah, Perdana ParckCity chairman Yaw Chee Siew and chief executive officer Lee Liam Chye. The hospital will comprise a three-storey podium block featuring full service outpatient clinics, advanced diagnostics services, six operating theatres, a 20-bed critical care unit, and a six-storey ward. It will be the fourth full-fledged hospital operated by Sime Darby Group. It now owns and operates the 393-bed Sime Darby Medical Centre (previously known as the Subang Jaya Medical Centre) in Subang Jaya and the Sime Darby Specialist Centre Megah in Petaling Jaya. The group recently acquired a 220-bed Sime Darby Medical Centre Ara Damansara, which is under refurbishment and will open by 2011.